Britain's biggest intelligence agency has denied claims it is building a vast database to store all communications. GCHQ director Iain Lobban said its approach is "surgical" and that such a database would be "impossible". "We're looking for that tiny, tiny proportion of communications out globally which is of interest to us." GCHQ intercepts phone calls, emails and other communications around the world, and some conspiracy theorists believe the agency captures all exchanges. GCHQ has traditionally kept a low profile but in recent years has worked increasingly closely with other parts of government and industry and is now seeking to explain more about its work to the public. "Sometimes people forget about us and yes sometimes that can actually be quite helpful," GCHQ Director Iain Lobban told BBC Radio 4 in his first interview. "Against that I believe in accountability, I believe in openness and I think we should be accessible where we can be. "I don't want to tell you precisely what I can and can't do in terms of exploiting communications because I would see my adversaries or intelligence targets or terrorists move to different communications behaviour." About a third of GCHQ's effort goes into counter-terrorism work. Another major aspect of its work is supporting military operations. Staff, known as Government Communications Officers, are embedded with the military including some in Afghanistan who act as a point of contact between commanders in the field and the intelligence teams in Cheltenham providing information on Taliban activity. 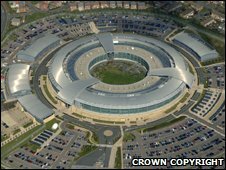 GCHQ has also been expanding, filling up its modern new doughnut-shaped building in Cheltenham. Underneath the main offices are vast underground halls containing thousands of racks of computers. Some conspiracy theorists believe GCHQ has the technical facility to capture all email and telephone exchanges. Many websites speculate in great detail about the agency's supposed ability to track communications which involve certain key words. But Ian Lobban denies such claims. "There's no such database, no such access and it would be impossible anyway in my view," he says. "Can we listen to everything? No we can't," he says, arguing that the organisation works along strict guidelines of proportionality and accountability. "Do we try to listen to everything? No we don't." The lack of information on what GCHQ really does has led to many theories about its capability. "I particularly like the one which says anytime anyone says the word 'bomb' in a conversation that tapes start whirring and an individual is geo-located. It's simply not like that," argues Lobban. "What we aim to do is to focus down on known targets or try to establish new unknown intelligence targets and then restrict as closely as possible, focus as surgically as possible on that individual's communications and then produce intelligence." GCHQ - Cracking the Code is on BBC Radio 4 on Tuesday 30 March at 2000 BST. Or listen via the BBC iPlayer.